Letterfrack village is an enchanting Quaker village renowned for its live traditional Irish music, with a great choice of places to eat and drink, with three pubs, an award winning restaurant or dine in the elegance of the Rosleague Manor Hotel. Planned and unplanned traditional music sessions a feature. Why not have a picnic in the park, the village has a well stocked supermarket with deli food counter for take away lunches. Fishing is available from the local pier, from where you can take a boat trip, to fish or look for dolphins. Don’t forget your souvenirs from “possibly the most interesting craft shop in the west” located beside the pier. 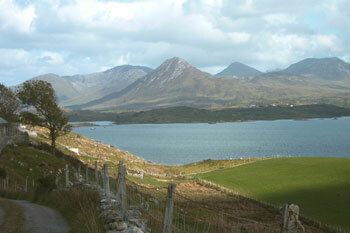 The entrance to Connemara National Park is a five minute walk away. There are some lovely walks including a track all the way to the top of the Diamond Mountain, which is suitable for the most inexperienced hill walker, well worth the effort for spectacular views over Letterfrack village, Connemara self catering cottages and Kylemore Abbey. Letterfrack is home to the GMIT Furniture College, an internationally renowned furniture design college. A visit to the permanent exhibition in the college is well worth a visit. Small library with internet access. Families and children will enjoy the village with premises being child friendly. Nature and art workshops are held twice weekly in the National Park as well as talks on Connemara Ponies, Connemaras History, Flora and Fauna to mention just a few. Discover the local history, culture and heritage of the sea and country life or visit the Country and Sea Life Centre in Derryinver, an ideal visit for all the family, which has a tea room serving home made food overlooking Derryinver Bay. From here book your tickets for a trip aboard the ‘Queen of Connemara’, with an enclosed seated lounge and an open upper deck. The tour takes you along the shores of the Connemara National Park with large varieties of sea birds and perhaps a seal or two.